The idea of forming the Inland Inferno Triathlon Club was first conceived when a small group of triathletes from the Inland Empire got together to watch the 1995 Ironman Triathlon World Championships on TV. As this hearty band of triathletes watched the best in the sport battle it out in Kona, the first seeds of IITC were formed. There would be a club that could train and race together. It would be open to people of all abilities and levels of experience. Members could share their collected knowledge and help each other improve. These were lofty goals in a time before easy internet access and professional triathlon coaches. In early ’96 the club started to hold monthly meetings at Hudson’s Grill in Pomona and get together for swim workouts at the Industry Hills Aquatic Center (both of those places no longer exist!). Bike and run workouts were centered around Bonelli Park in San Dimas. Bonelli was the perfect spot since a local triathlon series was held there every spring. Bonelli Park continues to be a primary meeting place for club workouts and events. The club needed a name, and several ideas were tossed around at the first few meetings. The name had to let people know who the club was and what they were about. When the members discussed were they lived, the summer heat was always mentioned. They also wanted to stand out from other tri clubs. At that time the only triathlon clubs in Southern California were in San Diego, Orange County, or Santa Monica. Finally, a name that had it all was brought up for a vote, and The Inland Inferno Triathlon Club was born. It was important that the word “Club” be used rather than “Team.” The emphasis was to be placed on participation over performance. The club’s guiding principle was to be (and still is) that everyone can join and participate to the highest level they are able. 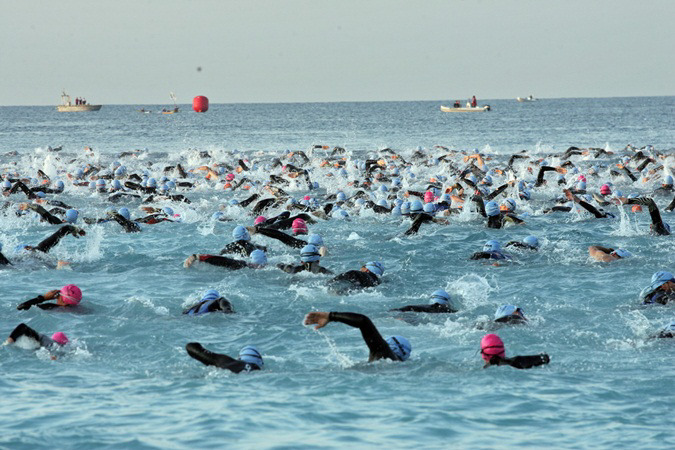 A member's first sprint tri would be cheered just as strongly as their 10th Ironman finish. From those humble beginnings, Inland Inferno has continued to grow, mostly by word of mouth, and spread their love of triathlon and all endurance sports. IITC members have competed in hundreds of triathlons, marathons, adventure races, open water swims, century rides, and more. The club has been represented at races in nearly every state and several countries including national and world championships. Along the way Inland Inferno has developed a relationship with many prominent sponsors and professional triathletes. Inland Inferno has a well-earned reputation for giving back to the sport through its volunteering and community outreach programs. The Ironman viewing party that started it all has since become a huge annual tradition. IITC members gather every year to watch the Ironman, relive the past year’s accomplishments, and set goals for the future. Inland Inferno will continue to be a source of education and inspiration for triathletes or anyone with a goal.